Today, June 27th, 2018, the Japanese spacecraft Hayabusa2 closed in on the asteroid Ryugu, where it will aim to collect samples, deploy rovers and landers, and even create a small crater to examine the inner depths of the rock. It'll be one of the most comprehensive investigations into an asteroid yet, and will hopefully give insight into our early solar system as well as the origins of life on Earth. "First of all, the rotation axis of the asteroid is perpendicular to the orbit. This fact increases the degrees of freedom for landing and the rover decent operations. On the other hand, there is a peak in the vicinity of the equator and a number of large craters, which makes the selection of the landing points both interesting and difficult. Globally, the asteroid also has a shape like fluorite (or maybe an abacus bead?). This means we expect the direction of the gravitational force on the wide areas of the asteroid surface to not point directly down. We therefore need a detailed investigation of these properties to formulate our future operation plans." 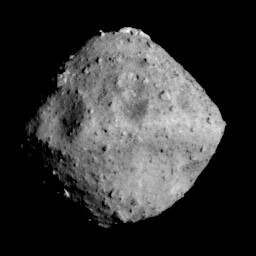 Ryugu is a carbonaceous asteroid, and is suspected to have a similar composition to the carbonaceous chondrite meteorites that have fallen to Earth in the past. Those meteorites have been found to contain organic compounds and even water, and have been proposed as a potential answer to the question of how organic life began on our planet. One of the remaining questions, however, is whether those meteorites possessed organic compounds and water to begin with, or whether the meteorites picked them up after impacting Earth. Investigating Ryugu will allow scientists to study a carbon-rich asteroid in its own environment and see if it already contains the building blocks of life. Either way, the Hayabusa2 mission (and the nearly simultaneous NASA mission to Bennu, another local asteroid) will provide scientists with a wealth of information about the composition of our ancient solar system. In a statement reported by Scientific American, Nancy Chabot, a planetary scientist at the Johns Hopkins University Applied Physics Laboratory, noted that: "There are going to be so many groups around the world that are going to be able to study the samples for decades to come." With more and more attention being paid to exoplanets, learning how our uniquely life-friendly solar system formed promises to open new doors for astronomers and astrophysicists. Best of all, the missions to Ryugu and Bennu will have some overlap, allowing the teams to compare their findings. According to Chabot: "If the samples [from both asteroids] turn out to be identical, that would be telling us something very fundamental about how homogeneous materials were in the solar system. But my money is on the samples showing us some surprising differences." Editor's note: cover photo depicts artist's concept of OSIRIS-REx, not Hayabusa2.